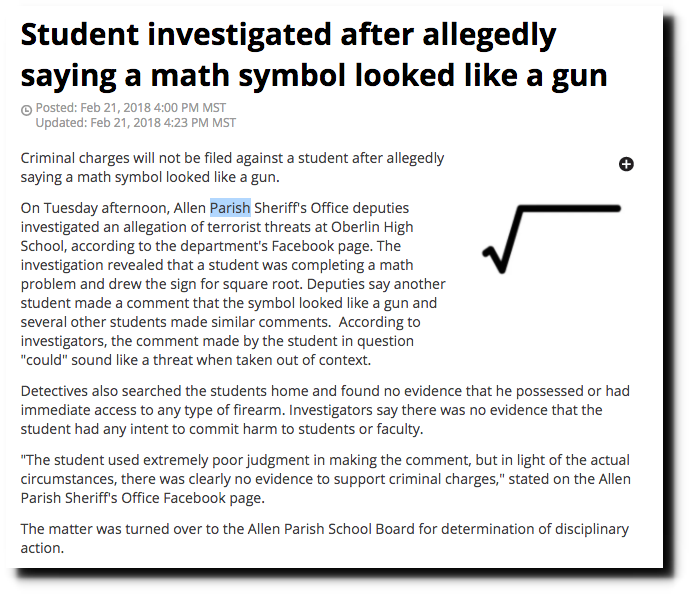 When progressives aren’t threatened by cookies shaped like guns, they are terrified by mathematical symbols. It could also look like crowbar that could be used to hit someone over the head. Expel the student! Ban math! Students need safe schools! It’s all Trump’s fault! This is pathologically stupid. Draw a outline of a gun and they search your home for “evidence” if intent? That’s wrong in so many ways. The effort to be over-responsive is pathetic. Sometimes a square root sign, although it may look like a stylized gun, is just a square root sign. Nothing the abstract resemblance to a gun does NOT mean the observer is planning a mass murder. Wow, so pathetic it’s pathitiful, both pathetic and pitiful. The person who “prosecuted” this “threat” should be billed for the waste of time and manpower. Today’s liberals are of low caliber. That’s because they are actually leftists, and not liberal at all. And pi looks like an assault rifle! We must ban pi and all numbers above 2 because brain hurty. and i did not even have a gun license. And that’s why you need weapons as at one point the perversions and aggressions of these children will be systematically unleashed on people who do not follow their sick communistic agenda. Perhaps if any kid says something about any other and the word “gun” is used, then the teacher/staff are required to call police. I don’t know, but if any kids goes home and starts to tell mommy a “gun story” I imagine there would be hell to pay if the “school” had not called police. And decimal points look like pellets, so math had better confine itself to integers. AN ASTERISK LOOKS LIKE AN EXPLODING BOMB! I am so triggered right now. I guess they will have to stop teaching long division as well. On second thought, do they even teach math any more? They don’t teach they brainwash. But this new Hitlerjugend has to realise they are only cannon fodder for the new world order. Who do you think is financing this project? Seattle resident Rebecca Morris, a New York Times best selling author, made a call to the Seattle Times to report something disturbing. Someone in on her street was flying a Confederate flag outside their house. Could this be a neo-nazi infiltration of her idyllic Greenwood neighborhood? The Norwegian flag owner was fortunate it was cleared up before the arrival of SWAT team snipers. 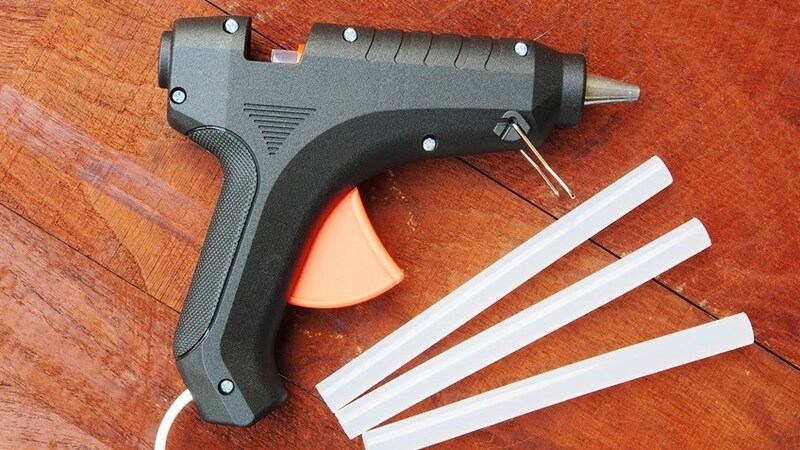 A “thorough investigation” and “campus-wide search” later revealed the true source of the complaint: an art student working on a project had been seen carrying a glue gun. By Tuesday morning, the all-clear was sounded but not before a SWAT team, a variety of local law enforcement agencies, and what was described as “a tank” had responded to the incident. It has black plastic, appears to have a bipod for long range shots, and is clearly semi-automatic. It must be an assault glue gun. Have you ever got some of that hot glue on you? OUCH !! Yes, it sticks and hurts like hell. Did you read about the Philippino ship crew that went all medieval and repelled pirates trying to board their ship by pouring hot oil and water on them? I like the thought of pirates yelling OUCH! Government failed to protect the children at Parkland school. Therefore, you must give up your weapons so you can be protected by the same people who failed to protect the children. Salvador Dalí could not have painted anything as surreal. Reading the story and additionally the comments makes it abundantly evident that the libtards are truly insane… it’s no wonder they’re the party of anti-science nitwittery such as CAGW… science (and mathematics) scares them because all of reality scares them. Liberalism is a mental illness comprised of equal parts rejection of reality, and construction of a twisted ‘alternate-reality’ based upon shallow understanding of how reality works. It is a manifestation of the liberal’s refusal to grow up and accept reality, evidenced in large part by their refusal to take responsibility for their behavior… hence they believe they are entitled to nanny-state hand-holding throughout their lives, and their desire to change long-standing rules of behavior until there are no rules that mean anything (reference fake-Pocahontas, men in dresses being allowed into women’s restrooms, etc.). There’s a reason they’re known as “libtards”, after all. The only good thing about libtardism is that it’s self-limiting… eventually they start eating their own, driving out all but the most radical as the rest come to their senses and realize that they’ve subscribed to a destructive ideology. And what did professor Menzio conclude from the idiotic experience? Did he blame the American Airlines morons who kicked him off the flight for using algebraic notation? “What might prevent an epidemic of paranoia? It is hard not to recognize in this incident the ethos of [Donald] Trump’s voting base,” he said. This is the standard direction in which our “elites” march on their quest for solutions. We are doomed. And doomed. Did he ask the various people involved (complainant, pilot…) who they vote for, or did he just make a rash assumption? What, is Rothbard claiming we can’t measure and calculate social phenomena like ethos, emotions or the intensity of racism, sexism and cisgenderism in America? That’s nationalist male chauvinist racism and we must measure it before we can eradicate it. Professor Menzio easily recognized the evil Trumpian ethos that booted him off the plane. He should apply for a National Science Foundation grant to develop the equations that define it. Outside of the sciences these symbols could be very threatening. In chemistry too; equations use arrows. Is this not cultural misappropriation? Also, the order of operations in algebra is a racist patriarchal scheme to normalize hierarchical social structures. Negative and positive numbers are a cisgendered model where everyone who doesn’t feel like one of predefined two genders is relegated to zero. I could go on about that vile thing.